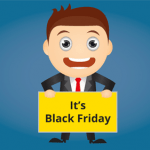 Black Friday is celebrated in the United States on the fourth Thursday of November and is considered as the beginning of Christmas shopping season and it’s being celebrated since 1952. But, the term “Black Friday” was not so popular until 1980. In this day retailers offer various attractive discounts on purchase. It’s basically a shopping festival day.